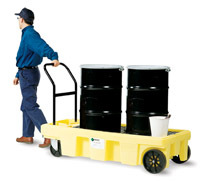 Easily transport and dispense from 55 gallon drums with the Poly-Dolly® with no mess. 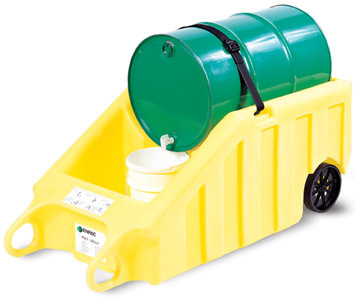 Easily transport and dispense from 55 gallon drum with the Polly-Dolly®. This multi-functional, two-wheel dispensing station acts as its own secondary containment. Transports and dispenses 55 gallon drums. Tough polyethylene construction cannot rust or corrode. Integrally-molded handles for extra strength and easy lifting. 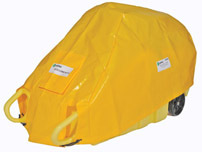 Tarp is designed to fit Poly-Dolly to resist the effect of weathering and provide UV-inhibitors. Constructed of High Density Polyethylene fabric with a document pouch for MSDS.